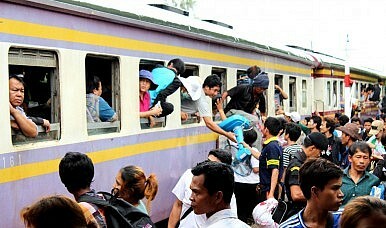 Fears of a crackdown on undocumented workers in Thailand have caused a mass exodus of Cambodians. Around 170,000 Cambodian migrant workers have fled Thailand to escape the Thai junta’s alleged crackdown on undocumented workers. As part of his effort to restore order and promote economic growth, coup leader army chief General Prayuth Chan-o-Cha recently warned that the Thai military would better regulate the workforce to free up jobs for Thai nationals. Days after the speech was given, Cambodian newspapers began reporting that many illegal migrant workers located in Thailand were voluntarily returning, sometimes being transported to the border by the military. “They are scared and decided themselves to come back. One day, around 100 or more came with Thai military transporting them to the border,” a Cambodian border official said on June 9. These rumors have spread across the large community of Cambodian undocumented workers in Thailand, causing panic and resulting in a mass exodus in recent days that Cambodia and Thailand have struggled to cope with. Altogether, by the end of the day on Monday, some 170,000 undocumented Cambodian nationals had fled Thailand since June 7, according to Geneva-based the International Organization for Migration (IOM), which is providing transportation for vulnerable migrants on the border. This is incredible given that Thai’s military junta had just recently estimated that there were only 90,000 illegal migrants in all of Thailand, which also boasts a massive undocumented Burmese population. IOM also said that the Cambodian army had begun mobilizing a 100 trucks to transport the returning migrants from the Thai-Cambodian border back to where they were from. It also said that IOM itself had “dispatched 27 buses and assisted more than 4,800 of the most vulnerable migrants to-date.” The Australian embassy in Cambodia has provided $20,000 in funding for the effort. Despite the quick mobilization effort, the rapid influx of migrants has overwhelmed Thai, Cambodia and international aid groups’ capabilities. This has already resulted in casualties. Most tragically, over the weekend a Thai army truck carrying Cambodian workers towards the border flipped over killing 7 individuals and injuring 13 others. Altogether, a total of eight people have been killed and 19 injured while trying to flee Thailand in recent days, Cambodia Daily reported. The same newspaper reports that Cambodian authorities are struggling to handle the massive influx, and makeshift aid camps had been established on the border. Meanwhile, the Thai Junta, which calls itself the National Council for Peace and Order (NCPO), is denying it initiated a massive sweep of illegal migrants, instead claiming the Cambodians are leaving on their own accord, scared off by rumors of a crackdown. “The NCPO has no policy to sweep and clean, but teams must go to areas where there are illegal laborers to organize and manage the foreign workforce, as we have accumulated problems over the past 10 years,” a NCPO spokesperson said on Monday. While there are some conflicting reports, most people speaking to journalists seem to agree that they left voluntarily out of fear that a violent crackdown was occurring. Is Cambodia’s Foreign Policy Heading in the Right Direction? Cambodia needs to recalibrate its relationships with the US and EU, or risk becoming overly reliant on China.